This note affects ONLY customers whose Olimex device has at least one FT232RL IC with the specific week identification of 1213! 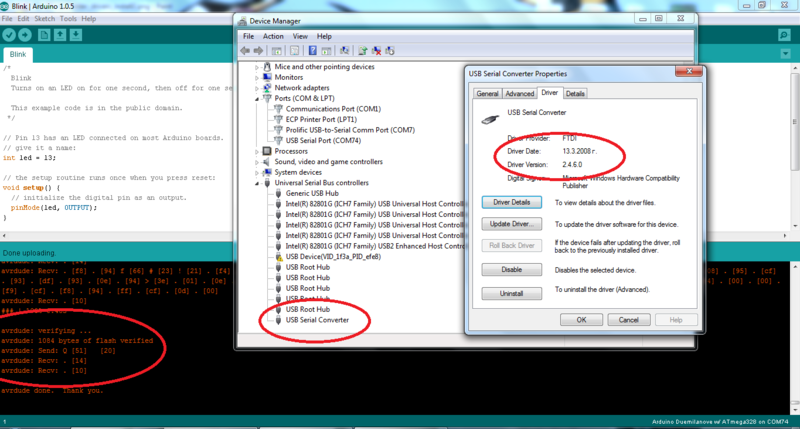 After few reports by customers we investigated the inability of some devices to communicate via USB with a personal computer, despite that the customers had followed all recommendations and had downloaded latest FTDI drivers (straight from their web site). We discovered that the cause of this problem is connected to FT232RL chip incorporated in their design. The issue affects any Olimex board that uses FT232RL revision C with week number 1213 (the number on the second row of the FTDI chip name; it means year 2012, week 13). Please check the schematics of your device (if they are available) and check if your Olimex device uses any FTDI 232RL from the specific week. If that is the case and you experience inability to establish proper communication with your computer then there is a workaround to make it working. The problem with 1213 FT232RL is that these ICs seem incompatible with the latest FTDI drivers (drivers that end with 30, 28 and 24). The latest working drivers for those ICs seem to be version 2.08.14. This might be a problem with a number of Olimex boards and tools but the most notable ones are: OLIMEXINO-328; EEG-SMT; AVR-GSM; PIC-GSM; PIC-MCP-USB; etc. 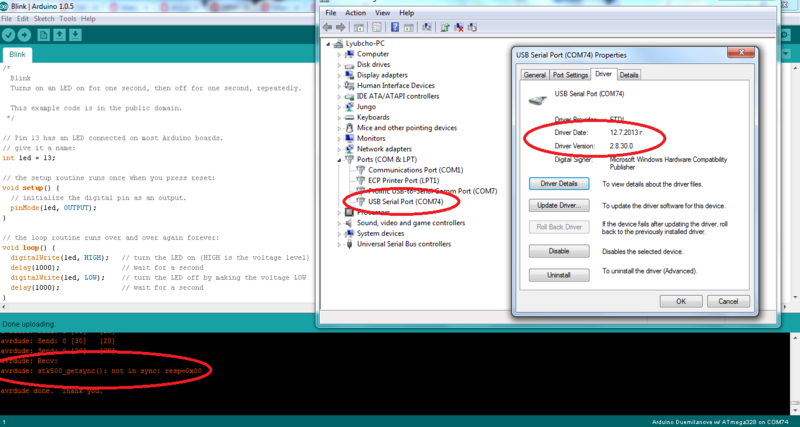 If you have one of those devices AND YOU EXPERIENCE INABILITY TO PROPERLY establish USB connection (or you have just inspected the FTDI FT232RL IC and it has the numbers "1213-c" on it) please use FTDI drivers version 2.08.14 or prior. 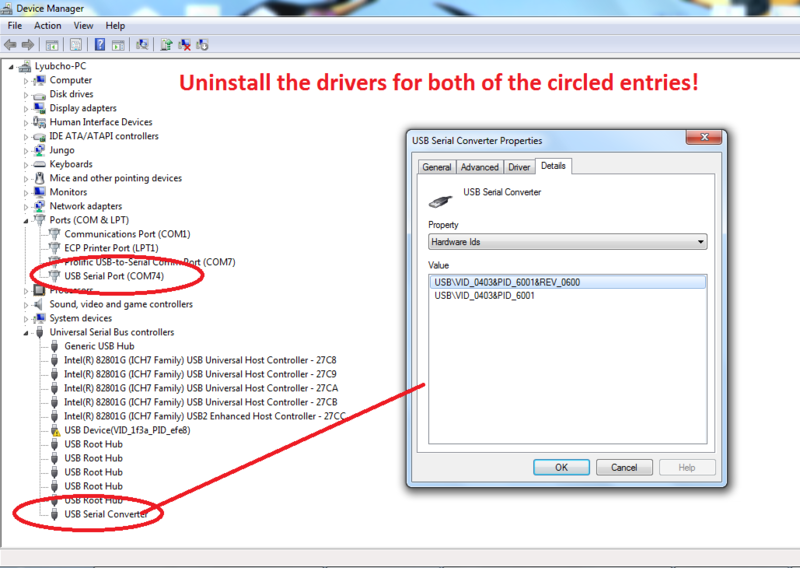 When uninstalling the drivers in Windows make sure to disable automatic driver installation (in case it updates the FTDI drivers with the latest ones). If using Windows XP you might need to manually delete FTDI files (since the drivers would keep automatically installing when plugging the device), or to manually point the updater to the .inf file in the older drivers folder. If using Windows 7, when uninstalling the drivers remember to put the tick for deleting the drivers back-up. We have questioned FTDI whether the driver problem related to the FT232RL manufactured in the 13th week of 2012 would be resolved in future FTDI driver revisions. P.S. THE ISSUE WAS FULLY RESOLVED BY THE END OF 2013. NO OLIMEX BOARDS MANUFACTURED IN 2014 HAVE SUCH A PROBLEM.